One night this week Annie and I attended the Craggy Range Wine Dinner held at the wonderful Non Solo Pizza Restaurant (commonly known as NSP) in Parnell. This was a superb six course degustation meal with wines from Craggy Range selected to match the foods. What a banquet it proved to be. Each wine was presented by winemaker Adrian Baker. Here is the menu with the matching wines. Six dishes of stunning food, six glasses of glorious wine. My favourite match was the smoked duck with the Pinot Noir from Craggy range’s Te Muna Road vineyard in Martinborough. To use an old cliché it seemed like a marriage made in heaven. 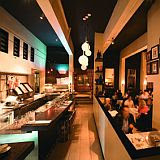 Cuisne magazine reviewed NSP in their November issue, pic above was taken from there. Read the review here. So it was a delight to find on my desk the next day two brand new books on NZ wines and vineyards. The first, the eagerly awaited annual from the doyen of NZ wine writers, Michael Cooper’s Buyers Guide to New Zealand Wines 2008, Hodder Moa $35. I have a copy of each issue going back to 2000, (the first edition appeared in 1992 but sadly I must have got rid of those early years when I shifted house last year), and it is interesting to observe how each year the book has got bigger. The 2000 edition has 336 pages while this new one has 528 pages which is indicative of the growth in the number of wineries and the acres under grapes. I immediately looked up Cooper’s comments and ratings for the wines I had consumed the night before and was pleased to see they all passed muster. This is part of what he had to say about the Craggy Range Pinot Noir from Bannockburn – 5 Stars (his highest rating), “serious yet sensual, supple & sweet fruited, with rich cherry/plum flavours, spicy oak and excellent density & complexity”. Right on Michael. He also liked the Craggy Range Pinot Noir from Martinborough – 4.5 starts for that one – “boldly coloured, fragrant, plumy, spicy bouquet”. The book starts with Cooper’s vintage report for each of our wine growing regions, this is followed by his best-buys for the year, the wines he rates as classics, guidance on how to use the book, and then each of the major wine varieties is dealt with each winery being listed in alphabetical order within varieties. It is totally user-friendly, and a must for everyone who enjoys their wine but likes a little guidance when confronted by the dazzling array at their wine store or supermarket. Each wine gets a page devoted to it where Cooper explains the reason for his selection. This morning I bought 6 bottles of Villa Maria’s Pinot Gris and next week I plan to buy half a dozen of the Mills Reef Cabernet/Merlot. The next book is something altogether different and whereas Michael Cooper’s name is very well known and held in the highest regard throughout the wine industry our next author is a virtual unknown, at least in this field. Wineries & vineyards:where to go and what to do when you get there! Janssen is a former book publisher (Reed Publishing) and since taking early retirement a couple of years back from that industry he has become something of a roving author specializing in books of this kind. Among his other books for example are 1001 Best Things to See and Do In New Zealand, and Excellent Short Walks. One of the hallmarks of his books is their absolute up-to-dateness, and this combined with their topicality, accesibility and usefulness means he is quickly establishing a reputation for himself on the NZ guidebook scene. This latest title is in a handbook format which makes it handy for both the pocket and the car glovebox. 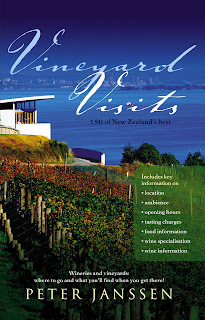 He has selected what he rates as NZ’s best 150 vineyards and provides key information on location, ambience, opening hours, tasting charges, food information, and wine specialization. Each vineyard (and of course Craggy Range is included) gets a page including a colour photograph; the book is printed on good quality art paper making the finished result pleasing to the eye. I hope that Janssen and his publishers plan to make this an annual publication.